Hiking has been a much-loved activity for over 30 years, and Africa is forever in my heart having lived in South Africa for 5 years in the late 1980’s. I first learned about trekking Kilimanjaro when I saw an IMAX movie on the subject in 2002, Kilimanjaro: To the Roof of Africa. A seed was certainly planted after watching this diverse group of people taking the trek of their lives. However, I only seriously began thinking, “what if,” about 5 years later. I did quite a bit of research, got on an email list, and considered it a little more each time the tour agent tried to get me to sign up. But I never committed to a plan. Then in 2011, I ruptured my Achilles tendon. Although I recovered faster than expected, it is still an injury that makes you stop and think – so, trekking the highest mountain in Africa seemed like something too big to even consider. 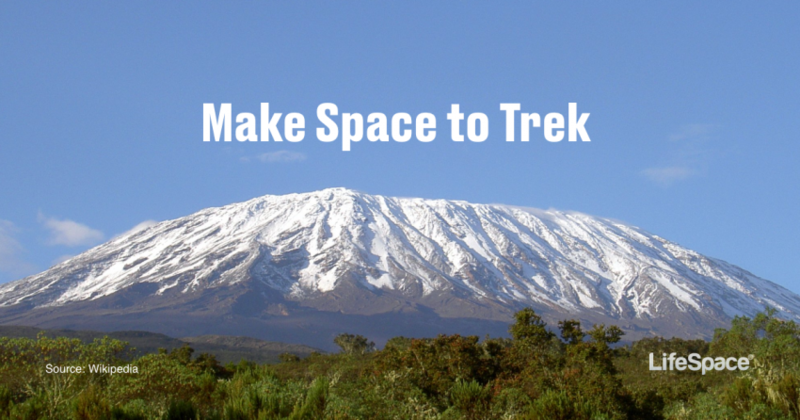 Now, here I am 17 years after seeing that movie, and somehow through recent important self-reflection about my life, a space opened in my mind to receive a very clear message – it’s time to plan a trek! Yoga and meditating are very important parts of my life and so is walking, hiking, and any opportunity to be out in nature. I enjoy the physical activity but also the chance to quiet the mind. It is a chance to be inspired and to gain clarity on what is important. It’s easy to pass time with daily responsibilities of career and family and neglect adventures that may seem daunting, even if it is something you desire. It is through this reflection and this quiet time that I have realized – now is the time to make space for Kilimanjaro! This adventure will take a lot of planning and dedicated time to a training program. There is money to be saved, equipment to purchase, travel plans to be made, and a training schedule to create and follow! I’ll to need a good tool like LifeSpace to get organized and track my milestones!